Rendering meticulous detail, Ambrosius Bosschaert the Elder conveyed the silky texture of the petals, the prickliness of the rose thorns, and the fragility of opening buds. Insects crawl, alight, or perch on the bouquet. Each is carefully described and observed, from the dragonfly's transparent wings to the fly's minutely painted legs. Although a vague reference, insects, short-lived like flowers, are a reminder of the brevity of life and the transience of its beauty. A rising interest in botany and a passion for flowers led to an increase in painted floral still lifes at the end of the 1500s in both the Netherlands and Germany. Bosschaert was the first great Dutch specialist in fruit and flower painting and the head of a family of artists. He established a tradition that influenced an entire generation of fruit and flower painters in the Netherlands. Ambrosius Bosschaert, November 14, 1840-December 5, 1926. During the 1600s the Dutch became Europe's leading horticulturists, and exotic flowers became a national obsession. Not surprisingly, flower painters were among the best-paid artists. In 1621, Ambrosius Bosschaert commanded a thousand guilders for a single flower picture. Nonetheless, his output was relatively small, for he was also an art dealer, handling works by artists like Paolo Veronese. Anticipating religious persecution, in 1587 Bosschaert's parents moved from Antwerp to Middelburg, a seaport and trading center second in importance only to Amsterdam. Six years later Bosschaert joined Middelburg's Guild of Saint Luke. 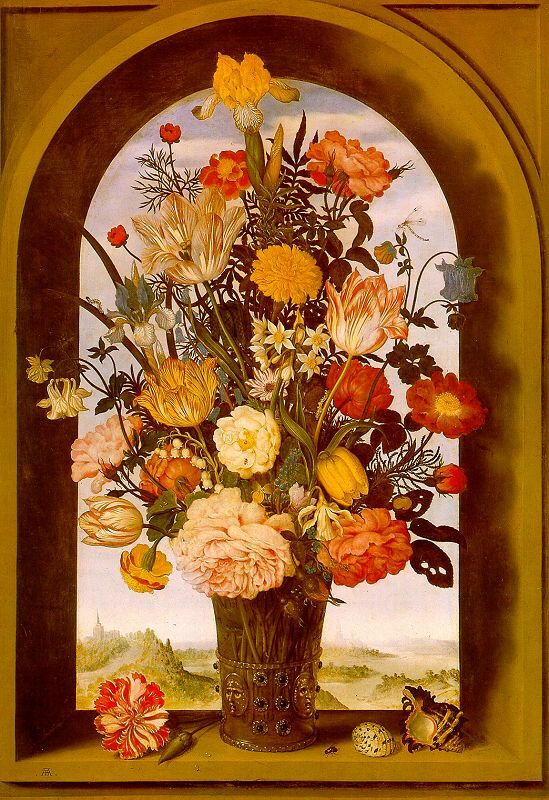 Bosschaert originated a genre that continued in that city until the mid-1600s: a symmetrically composed bouquet of flowers painted with seemingly scientific accuracy, more voluminous than those of his Antwerp contemporary Jan Brueghel the Elder. Bosschaert's works have been called flower portraits; each flower receives the same detailed attention as a face in a portrait. Usually small scale and on copper, Bosschaert's paintings combined blooms from different seasons, painted from separate studies of each flower. It is not unusual to find the same flower, shell, or insect in many pictures. Like his predecessors, Bosschaert sometimes included symbolic or religious meanings, such as the transience of life. The Blog Tour deadline is May 29th. Links must be added to the Art Bead Scene flickr page where you upload your entry. The Blog Tour will be on May 31st. Winners will be randomly chosen from all the qualifying entries on June 1st. Our Sponsors this month are Gaea Handmade and Mo Martin Creative Glass. Thank you for another beautiful inspiration. Wow, lots happening in this one. Very beautiful though. Are handmade resin beads good for the challenge?